After the train wreck that was my mug cozy, I felt like I needed to redeem myself as a knitter and I think I did, so I wanted to share this finished knitted object with you all. I found the INSULATE! hat pattern by Amy van de Laar on Ravelry a few weeks ago when looking for something to knit with two skeins of yarn John bought for me. 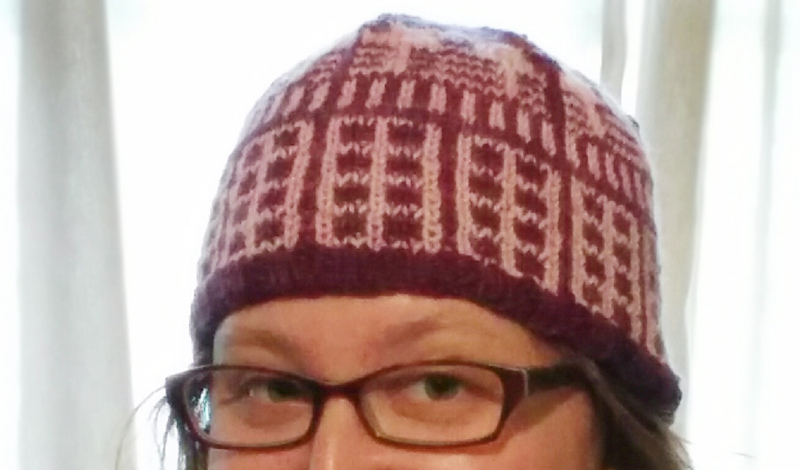 It’s a 2-color hat, covered in Daleks, and the pattern is free! I wasn’t sure about knitting pink and purple Daleks, so I held off on knitting the hat, hoping to find a more appropriate use for the yarn. But the urgent need for a pick-me-up knit trumped my color concerns and I decided to cast-on earlier this week. Oh, how I love to knit a hat. They’re so quick to knit up and this one only had 3 ends to weave in when I was done — quick finishing FTW. If you enjoy stranded colorwork, I’d definitely recommend this pattern. 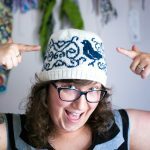 Amy (the designer) gives very clear instructions on how to knit the hat and how to knit it without needlessly wasting too much yarn. Rows with minimal color changes actually just use slipped stitches from the previous row so you don’t have to carry the other color around the back. Pretty snazzy! In other knitting news, I started knitting a shirtie today (that’s a shirt and a hoodie). This is my first non-accessory garment that I will be knitting. I’m nervous but excited at the same time. Will keep you all posted!